The air hose oil particulate monitor has two main components: a simple multi-wavelength scattering probe and a data interface that allows direct measurement of oil particle concentration. The probe records changes in particle concentration and offers potential expandability to include size, distribution and other chemical components. A prototype was successfully developed and tested to withstand the simulated pressures and concentrations that is experienced in the dive environment. Future development includes producing a fully functional device for field testing. Dr. R. Shashidhar from Polestar Technologies is the primary investigator for developing a real-time CO2 monitor to be used in mixed-gas rebreathers for Navy divers. When a diver uses a rebreather, they exhale gas that is filtered through a chemical scrubber containing soda lime to remove CO2 and allow oxygen and other gases to remain for rebreathing. If the scrubber fails, CO2 accumulates in the breathing loop, the diver experiences a progressive hypercapnia, may lose consciousness and drown without being aware of the hazard. 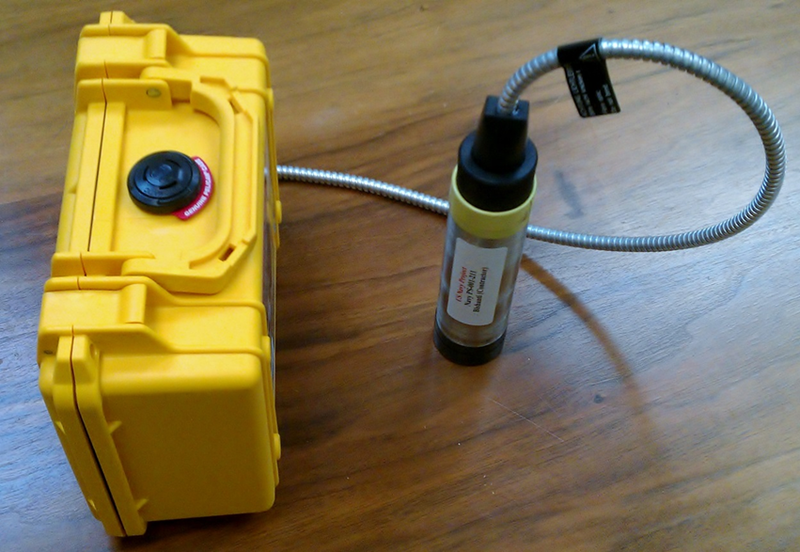 Thus, having a CO2 sensor in the inspiration side of the loop to warn the diver of scrubber failure would help mitigate dive accidents due to hypercapnia. The CO2 sensor is connected to the rebreather mouthpiece and an LED light indicator featured in the mask alerts the diver of elevated CO2 levels. A blinking red light appears in the diver’s visual plane whenever the CO2 level, monitored by CO2 sensing film and electro-optics, reaches a dangerously high level. This conveniently displays the CO2 level prominently without requiring additional gauges. In addition to calculated CO2 levels, data is collected on pressure and temperature readings. Future work still needs to be done for adapting the device for the military diving environment. Presently, to monitor for oil particulate in recreational breathing gas, dive operators can take safety filling precautions, such as not filling tanks near combustible engines and maintaining the compressor. Breathing gas samples can also be sent to accredited labs for analysis to detect contaminants such as carbon monoxide, CO2, oil particulates and methane. For rebreather divers, predive equipment checks and prebreathes are absolutely necessary, and equipment should be meticulously maintained to prevent incidents. Both of these monitoring devices have the potential to prevent injuries. It will be interesting to see if these concepts will become commercially available products and how they may affect dive safety. Awesome! Its really amazing post, I have got much clear idea about from this article.